A beautifully simple comic book. As an exercise in design for all, Life is invaluable. 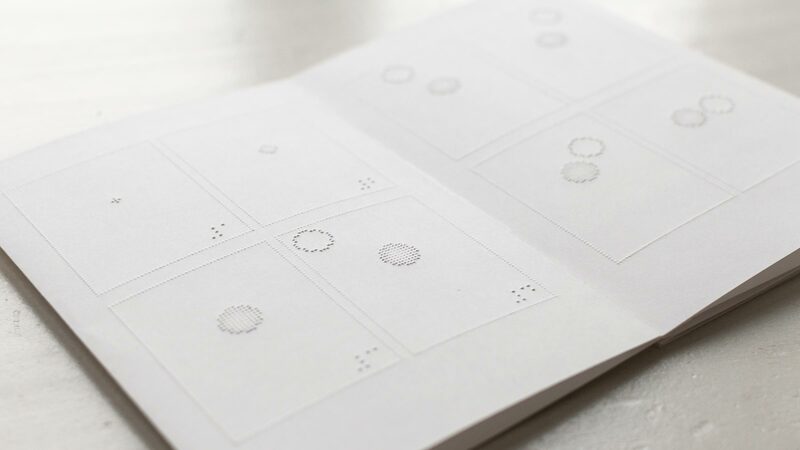 How do you translate a medium as visual as a comic book into Braille? Rather beautifully. Life has some definite possibilities for further exploration. See if you can make it to the final blank page without getting weepy. A simple, yet incredibly touching tale. We’re just impressed to see comics moving into new and exciting territory. Rich with soul and purpose. 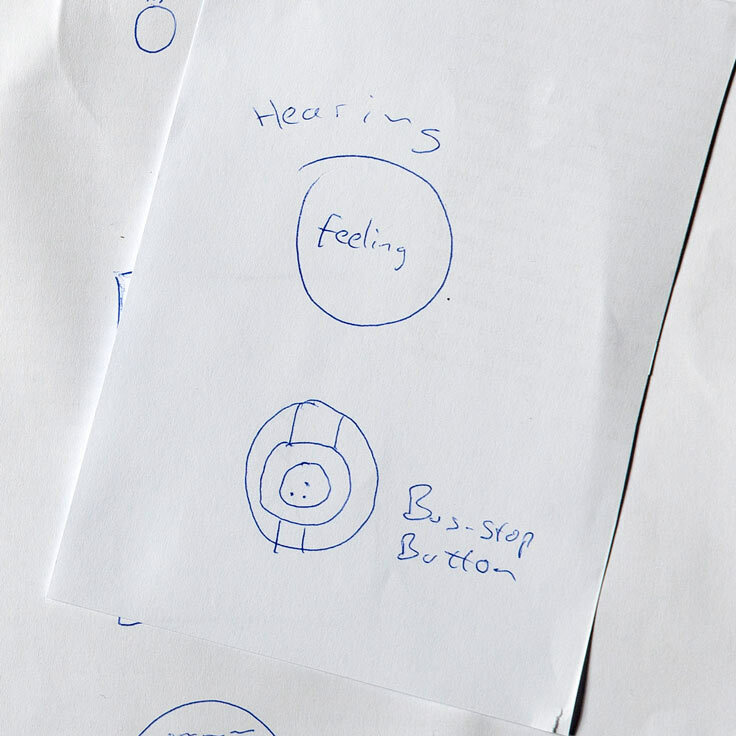 During my Interaction Design studies I went half a year abroad to try something new. I took a course about comics to find out if it's possible to create a short comic that is readable for people without eyesight. The reader should be able to follow and explore the story through touching the paper. 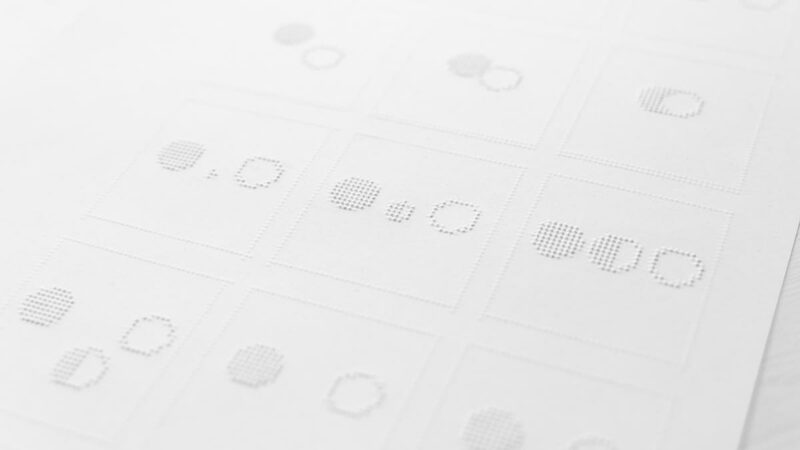 I saw it as a challenge and a chance to fathom the possibilities of tactile storytelling. I wanted to make a medium accessible to more people. Nota, helped me out with utilities and getting in contact with blind people. 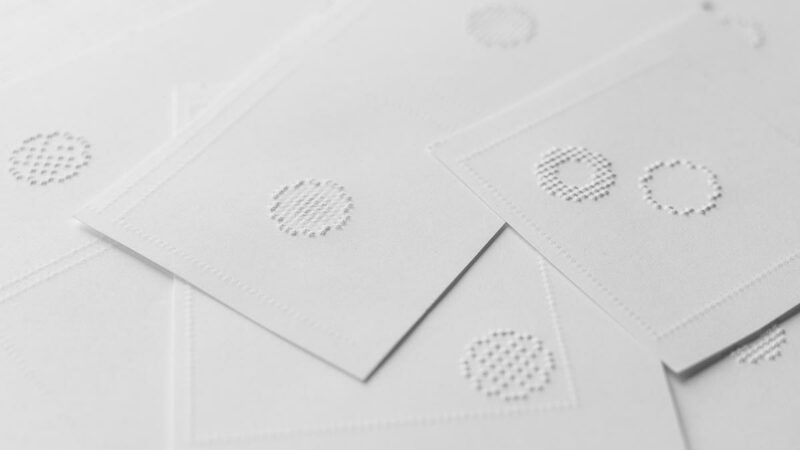 Michael, a braille proofreader at Nota was the first blind person I interviewed and a big help during the whole project. I want to point out that I don't know if this is the best or only way to create a tactile comic and if this comic works for every reader. After the first interview, I found out that simply translating a visual scene or environment into a tactile image wouldn't be an enjoyable experience. I therefore began thinking about a person's senses and compared them to each other. The sense of hearing was to some extent comparable to seeing. In order to translate it adequately, I though about reinventing the comic panel. By making it round I would have a 360° space around the panel and could mimic the position from where the audio comes from by placing the braille text on the respective place. 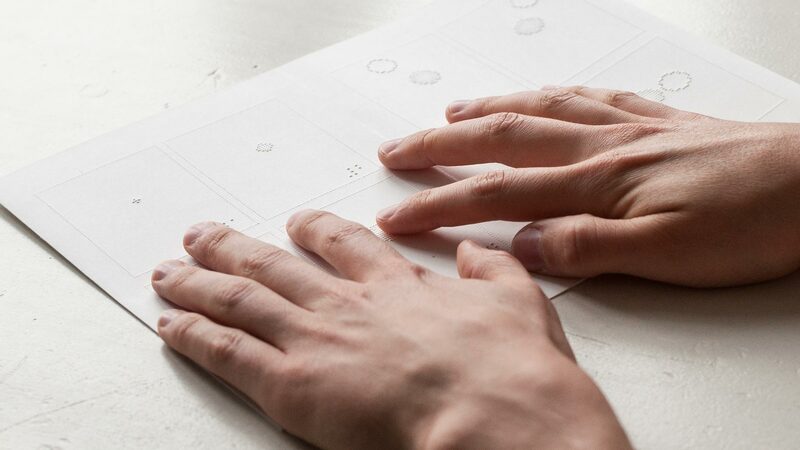 To enrich the reading-experience furthermore I thought of placing a tactile representation of the scene into the round panel. For example when I want the scene to be a bus I emboss a stop-button that you find in the bus, into the page. Somehow this idea didn’t feel right; not adequate and too far away from the comic-medium. It wouldn’t enable me to use the strengths of the medium. I dropped the idea and started again from scratch. After many failed attempts I finally experimented with storytelling through simple shapes and forms. With and without text. I always wanted to see how graphically simplified a story can be, without losing meaning. I wanted to use comic techniques, the users imagination and let the medium do the work. 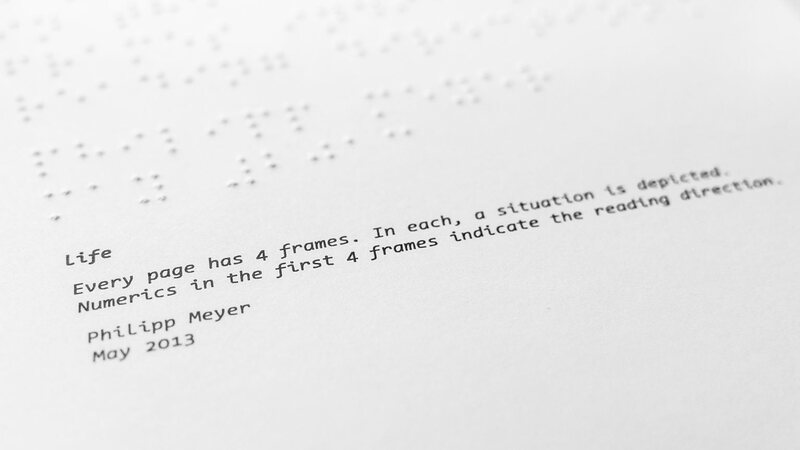 My goal was to create a story that is equally explorable for people with and without eyesight. But before creating a tactile prototype, I made a digital version and sent it to friends, to see if everybody understands the story through the title, Life. The Fibonacci sequence came in handy when choosing the pixel diameter of the circles. The whole comic is made with CSS. Feel free to double-click the characters but please don't move them around. Below is shown a digital version of the comic. If the user double clicks the circles they change their colors. The circles can be moved around for fun as well. There are 24 frames on the website. In each of the frames a situation is depicted. The first frame contains a small circle that gets bigger in the following two frames. In the fourth frame another circle with the same size appears in the top left corner. It is moving clockwise around the other circle gradually getting closer until they are side by side in frame 8. In frame 9 the circles are getting even closer, they are almost melting together. In frame ten they are side by side again. In the 11th frame a third very small circle appears in between the two. It is growing each frame until it reached the same size as the other two in frame 13. In the following 3 frames the new circle is moving to the right bottom corner until it moved out of the frame. In frame 18 are only the two circles from the beginning. One of them is slowly fading out until there’s only one circle left in frame 20. This circle fades out as well. Frame 24 is empty. Everybody got the digital version right away. With that in mind I started prototyping. 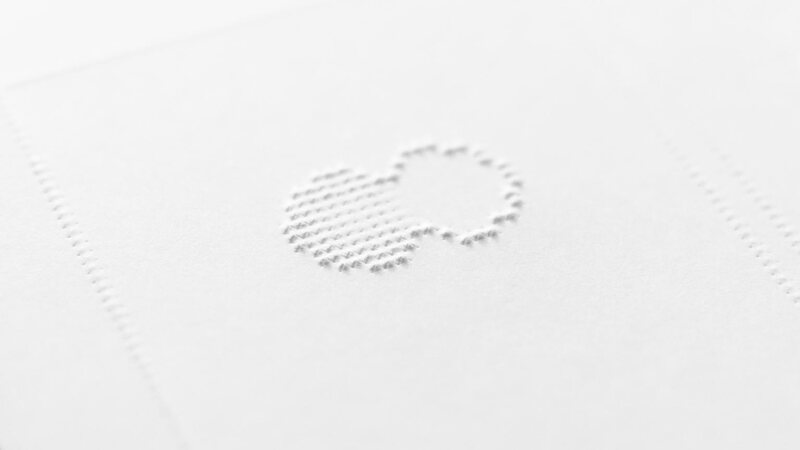 I adjusted the digital version to suit tactile needs and printed it on a special printer at Nota that is embossing paper. On the next day, I gave the prototype to Michael. 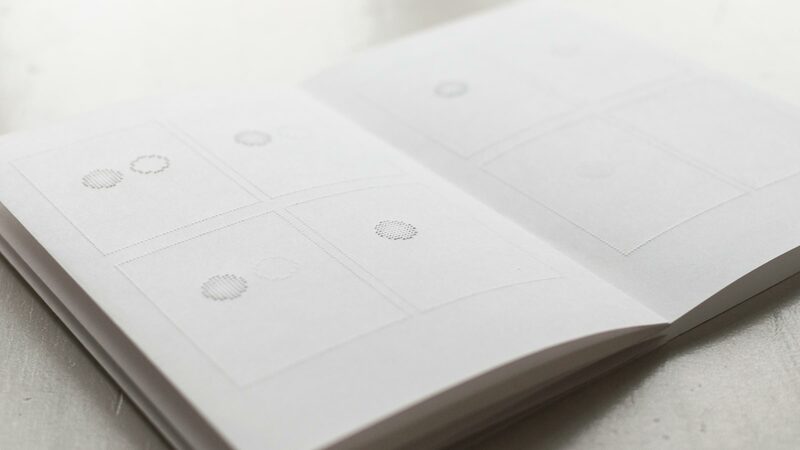 I was nervous and curious to find out if the tactile comic works. It did. I guess Michael was the first person who ever read a tactile comic. 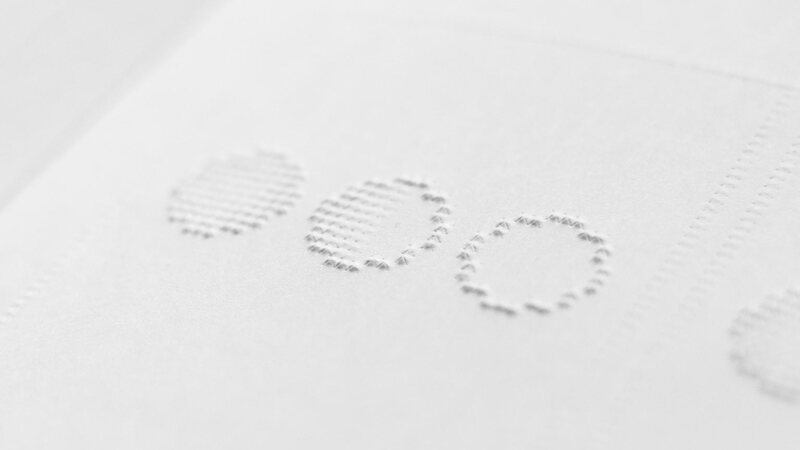 In the following weeks I gave the tactile comic to more blind readers. None of them had any trouble reading the different shapes. Yet some didn't connect the title and the story. So I did more refinements on the comic. I still wanted the reader to interpret the story in his way, to give some introduction I added a short text on the front-page. Every page has 4 frames. In each frame a situation is depicted. Numerics in the first 4 frames indicate the reading direction. I use a leporello folding. The early version was a hand-bound book, unfortunately the back sides were a bit distracting sometimes. 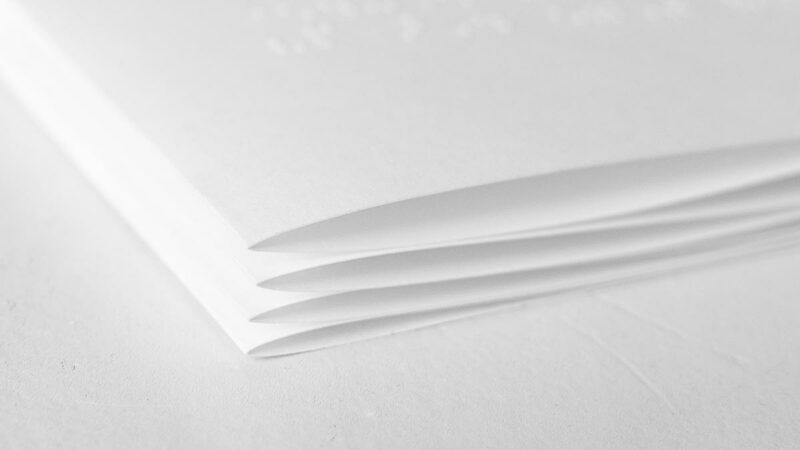 With a leporello folding, the reader never gets in contact with these. You can actually read the comic as a book or spread it out like a wide paper now. 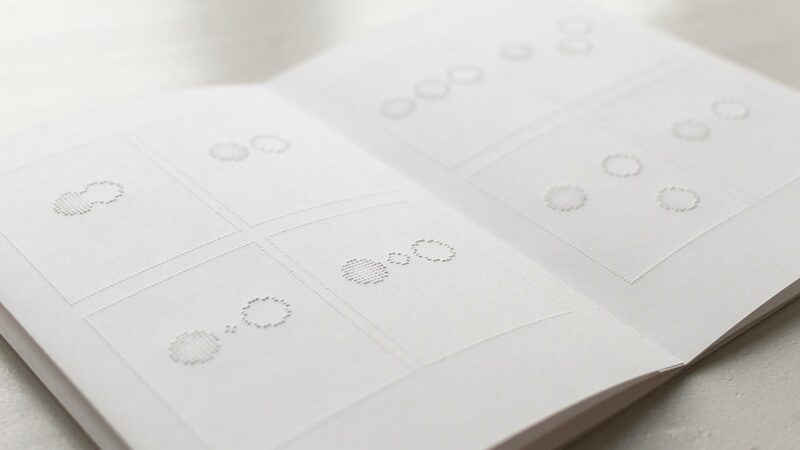 The Comic is printed on leftover paper from the braille book production at Nota. 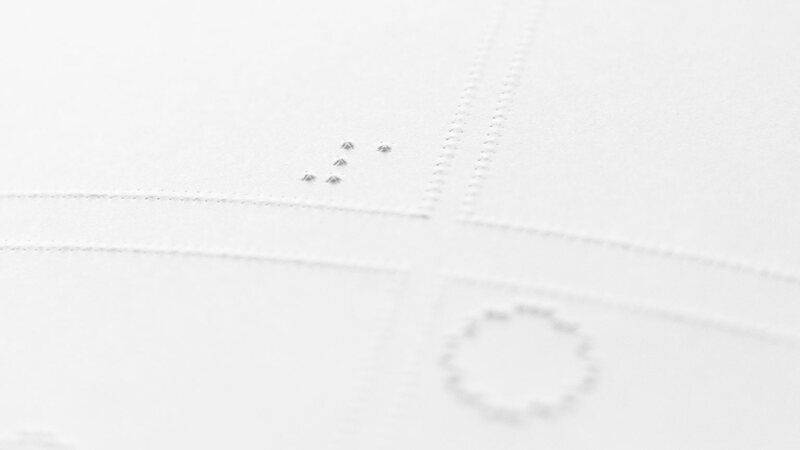 It's a special paper that keeps the braille dots in shape, for a long time. 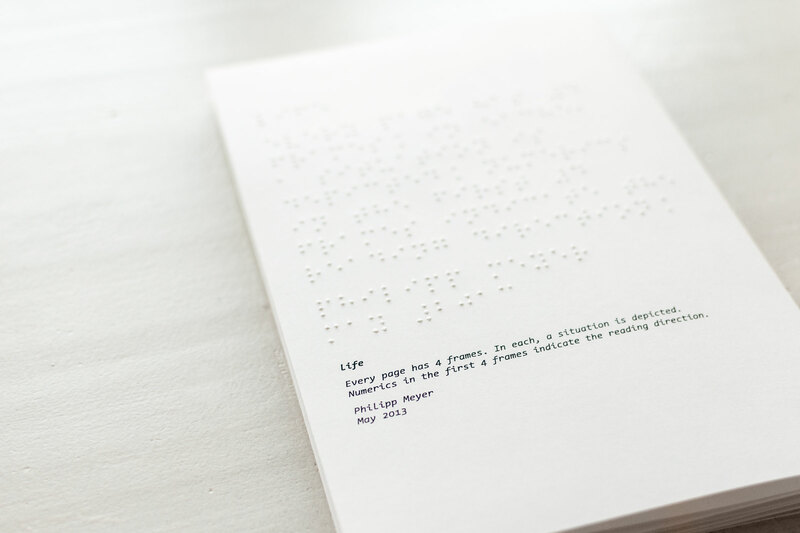 The braille text on the front page is translated to latin script underneath. In the very first versions of the comic this text was not included. Yet some readers said it would be a good idea to give some introduction. One has to take into consideration that most born-blind readers didn't get in contact with the comic medium ever before. For a better understanding, the first four panels are numbered. 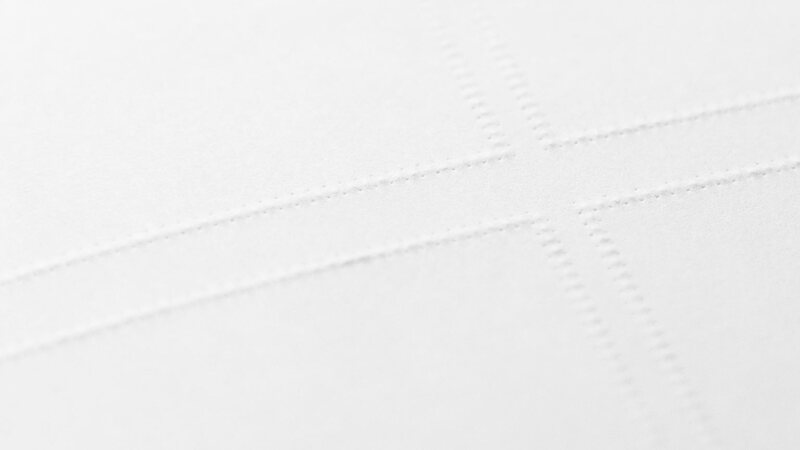 In braille, numbers start with the number sign # followed by a letter. #a means 1. The height of the first character gets lower towards the center. That gives the shape a softer touch. It feels nicer. The frames have a pretty low height to put the content first. Nevertheless they're very important as guides. 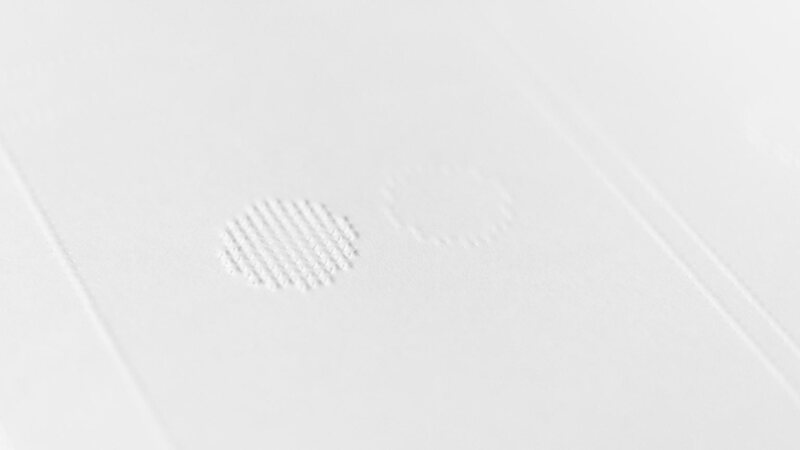 The printers resolution is 20DPI that's why the circles can't be perfectly round. I found inspiration in old computer screens to see how circles were created on low resolution displays back in the day. The third character is a mixture of the two other characters. It gradually fades from left to right. It took some time to get the details right and find characters that both, feel nice and are distinguishable. In the end the characters embossing height gets lower each panel. It's harder and harder to feel the character. This project was definitely the most challenging I ever did – yet the most rewarding as well. I will never forget the day when Michael read the tactile comic for the first time, experiencing a medium that did not exist in this form before. On that day I realized that it is possible to tell a story – without ink, text or sound – that comes to life through imagination. If you want to know more, feel free to read the essay about this project. 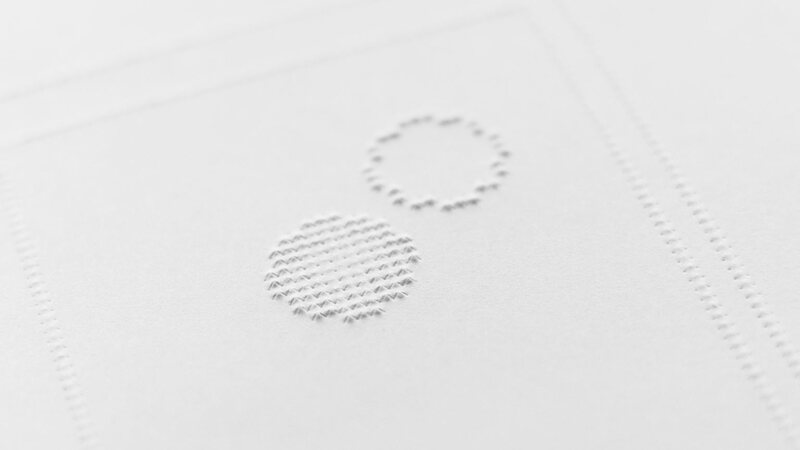 I am currently making some books for libraries and schools for the blind. There are a few books for sale as well. If you want to buy one of them, drop me a message. I want to thank Michael, Naja and the rest of the team at Nota for their great help. Furthermore I want to thank Jette and the readers at Ibos. Another big thanks goes to Jakob and Gunnar for holding the course.